Another successful Toronto Sporstmen’s Show is in the books. 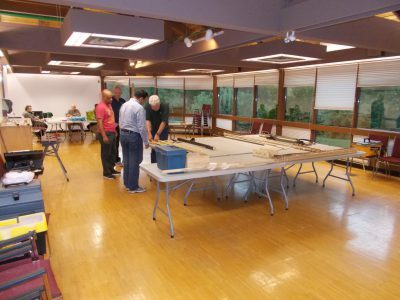 Once again, the Scarborough Fly and Bait Casting Association was on hand to show why we we are still one of best angling clubs in Ontario. We were well represented in the fly tying department, with SFBCA Fly Tying Master, Jurgen, pumping out some impress fly patterns. The perch pattern pictured below was a big hit and something rarely seen by most anglers. Last year, Jurgen gave a couple of the perch flies to our show neighbour Wayne Moreau from Kipawa Lodge. Wayne reported they were super effective for catching northern Ontario Pike and Walleye. Jurgen had more than a few offers to from anglers wanting to buy his flies, but he wasn’t selling. “Join the SFBCA and learn to tie them for free,” was his standard response. Our bamboo brigade was another big hit, with Paul Manuel doing most of the work. Despite all the new fangled gear and equipment at the show, it’s amazing to see people fascinated by old ways and old technology as exemplified by split cane. Overall, the show was a big success. We had 17 SFBCA members taking turns manning our booth and we talked to hundreds of potential new members (we have a sign up sheet with about 50 names that we are in the process of following up with). We also met many anglers and industry professionals who had heard of the passing of our President, Gord Deval, and offered their condolences. The goal now is to keep up the momentum from the show by welcoming potential new members. Hopefully some will join and give back to the club by helping us organize the SFBCA booth at the 2020 Toronto Sportsmen’s Show. Gord was a Canadian casting legend. Collectively, he held over 100 national and international records, including several word records over the course of his six decade career in distance casting. He also won the North American All-round Senior Championship 14 times. He served as the President of the Ontario Fly and Bait Casting Association in the 1950 and was founder and president of the Canadian Casting Association. 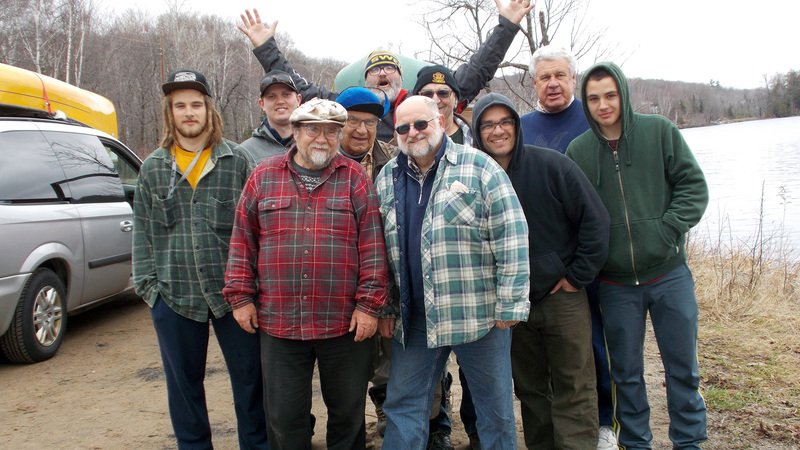 In the early 1980’s, Gord founded the Scarborough Fly and Bait Casting Association, which continues today as one of the GTA’s premier community-based fishing clubs. Known to his fishing buddies as “The Old Guy,” Gord chronicled his fishing adventures and misadventures in numerous books, including “Brookies, Browns and Bows,” Memories of Magical Waters” and “Fishing Hats.” Acclaimed Canadian author Paul Quarrington added to the Deval legend in his autobiographical book, “Fishing With My Old Guy”. In 2008, Gord suffered a series of strokes that slowed down his fishing and his writing, but not his passion for promoting the sport of angling. 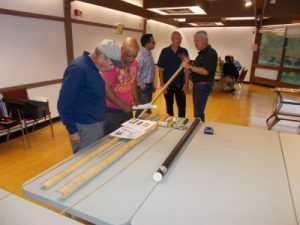 Until just a few years ago, Gord continued to operate the Scarborough Fly and Bait Casting Association from his home, guiding members in the art of tying flies and building split cane bamboo rods. In 2009, he was honoured for his achievements with a star, on Scarborough’s Walk of Fame (other inductees that year included TV star Marilyn Dennis and soccer ace Dwayne De Rosario). 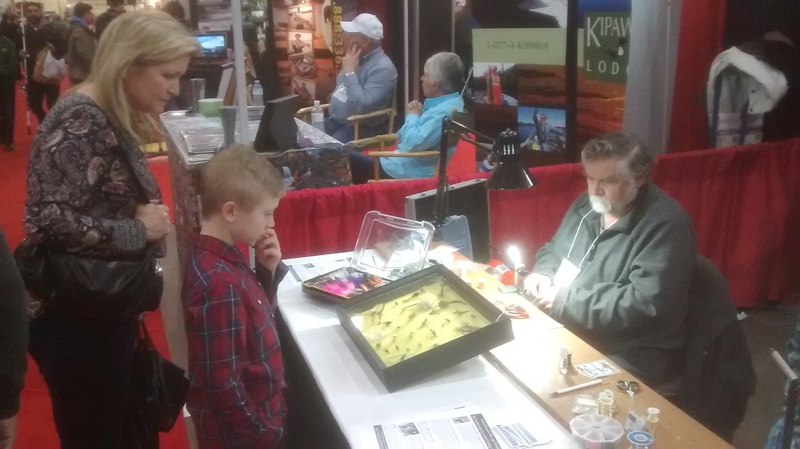 For most folks, March Break is a time to spend babysitting the kids or jetting off to sunnier climes, but for the Scarborough Fly and Bait Casting Association, mid-March is all about the Toronto Sportsmen’s Show (TSS). The 2018 Toronto Sportsmen’s Show was 8th or 9th show in a row for our club, and one of the better attended in recent memory. It goes without saying that if you are into hunting or angling or the outdoors in general, the TSS is a must visit. Attendees of the 2018 Toronto Sportsmen’s Show decide whether the flies are real or not as their creator, Jurgen, (right) looks on. Fly fishing requires lots of stuff…rods, reels, lines, tippets, leaders, wet flies, dry flies, streamer flies and much, much more. For a non-angler it can be pretty confusing to know what to get that fisherman/woman in your life. First off, unless your intended gift-getter has left Post-It notes around the house specifically listing brands, model numbers, etc. I’d avoid getting him or her big ticket items like rods and reels. Rods and reels are a very personal choice and should be left up to the angler to buy. 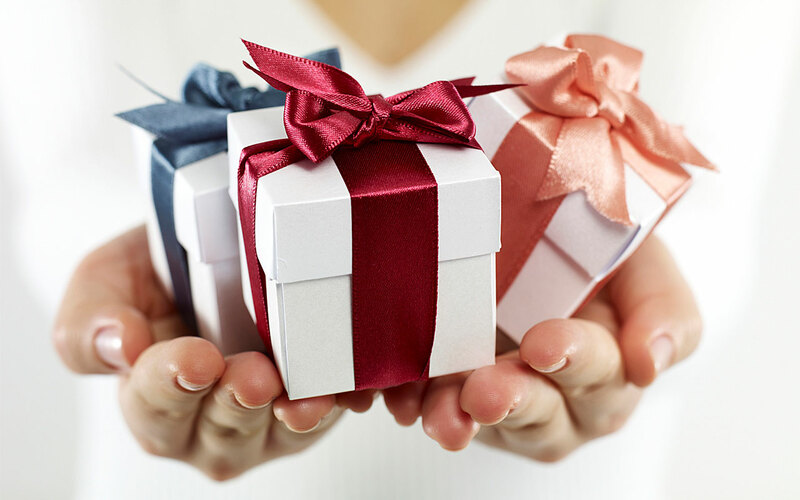 A gift card for a local fly shop might be a better option. The sky was clear, the weather was warm and the salmon were jumping…a perfect trifecta for the 8th Annual SalmonFest at Morningside Park, Toronto. This was the first year that the Scarborough Fly and Bait Casting Association has participated, and judging by the positive response we received it won’t be our last Salmonfest. We set our booth in the large playing field at the park and did fly casting demos, talked about salmon fishing and allowed folks to try some fly casting on their own. I would say in total the event attracted in the range of 1,000 people. 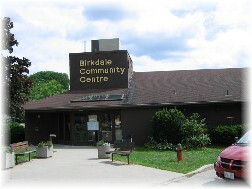 The Scarborough Fly and Bait Casting has a new home – the Birkdale Community Centre at 1299 Ellesmere Rd, Toronto. For years, the SFBCA held its meetings and workshops at the homes of various club members. Recent membership growth however necessitates moving to a larger facility to accommodate our fly tying and rod building actvities. Beginning October 3, we will be meeting in the Sunroom at Birkdale Community Centre. Meetings will be held every other Tuesday evening from 6:30 pm to 8:30 pm. Members of the public are always welcome to drop in and see what the SFBCA is all about. You can join the SFBCA for just $50 a year. For more info drop us an email at sfbcamembership@gmail.com.